Ingredients: Diced tomatoes, crab meat, diced green bell peppers, lime juice, chili peppers, Worcestershire sauce (vinegar, molasses, high fructose corn syrup, anchovies, water, onions, salt, garlic, tamarind extract, cloves, natural flavorings, chili pepper extract, hydrolyzed soy and corn protein), special blend of herbs and spices, salt. Appearance/Smell/Taste: At first glance through the glass jar, this salsa has a medium red color, and visible are some various chunks of the previously listed ingredients. You can even see little strands of crab meat in there. Hmm, this is going to be an experience for me I can tell you that! So I crack open the lid and take a large inhale. It smells initially of fresh tomatoes! Towards the back I get hints of the sweet green peppers, Worcestershire sauce, and a slight seafood smell. Mind you it’s not an overpowering seafood smell at all. 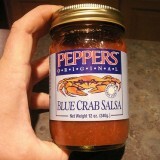 It’s probably right where it should be for a salsa with crab meat. And surprisingly this salsa is actually pretty hearty and thick. I wasn’t sure before I twisted off the cap, it seemed looser in the jar before I opened it. Peppers gets a big thumbs up for this! So scooping a heap out onto my tasting spoon, I sniff sniff one more time before I give it a taste. Just making sure that I’m matching up what I smell and taste together. The initial flavor that hits my tongue is the tomato flavor, sweetness from the bell peppers, and then a slight tickle of heat that fades in about 5 seconds. I’d say roughly a solid 3 on the HSB heat scale. I thought I saw chili pepper extract in that ingredient list someplace, didn’t I?!? Almost immediately following the dissipating heat is the slight hint of crab meat. It’s very subtle, which is probably why I’m actually enjoying this salsa thus far. But let’s give it the food test to see if it stands up to its initial taste test. I am surprised that picante and seafood is not common for the reviewer. Where I come from, hot sauce is served with any kind of seafood. Raw clams, raw pysters and red tabasco is delicious. Blue crab, both hard and soft shell, and crab cakes with red tabasco is delicious. I substitute dried tepin for tabasco with all these. 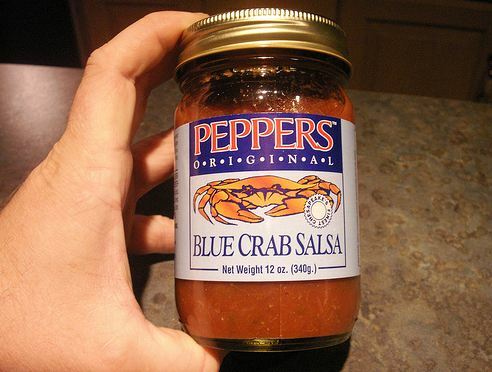 It’s only a small leap and seems pretty natural to make salsa with crab. Usually when I have seafood I’ll prepare it with basic dry spices or a rub, a little olive oil maybe and perhaps some fresh squeezed lime or lemon juice. Seeing the combo of crab and salsa together in a jar isn’t something that I personally would associate with a good mix. That’s just me and to each their own, especially depending on what region of the planet you may hail from. If I were born and raised in Delaware or coastal Maine perhaps I would find this to be a more common pairing. But alas I have lived mainly inland and now I’ve been residing in North Eastern, PA for the last 8 years.